2. Lightly grease a 9”x 13” baking pan and line with parchment (so longer sides of pan have a couple inches of overhang on each side). 3. In a large bowl whisk together flour, baking powder and salt. Set aside. 4. In the bowl of a stand mixer, cream together butter and sugar , with the paddle attachment, until light and fluffy. 5. Scrape down sides of bowl and with motor running add eggs, one at a time, until incorporated. Stir in vanilla. 6. Add 1/3 of the flour mixture and 1/3 of milk to the butter mixture and mix. Continue adding flour and milk in thirds until fully incorporated and batter is smooth, making sure not to over mix. 7. Pour batter into prepared baking dish and bake for 30 to 35 minutes or until golden brown on top and a toothpick come out clean when inserted into the center of the cake. 8. 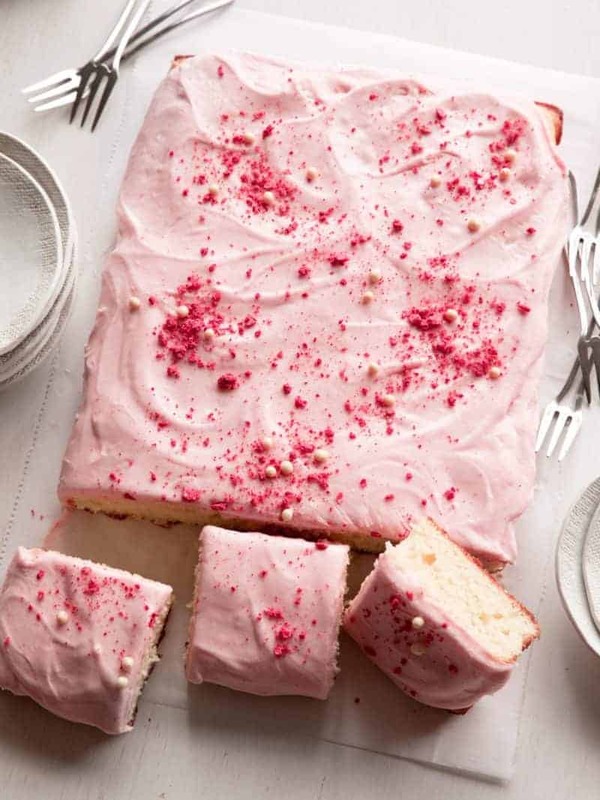 Place cake onto a cooling rack and cool completely. Once cooled, lift cake out by the parchment paper. Peel parchment paper from cake and transfer cake to a platter or cutting board. 9. For frosting: Place freeze-dried strawberries and powdered sugar into a food processor and pulse until smooth. 10. Cream butter in a mixing bowl of a stand mixer until light and fluffy. Add powdered sugar mixture to butter, with motor running until fully incorporated. Scrape down sides of bowl, add milk and beat together until smooth. 11. 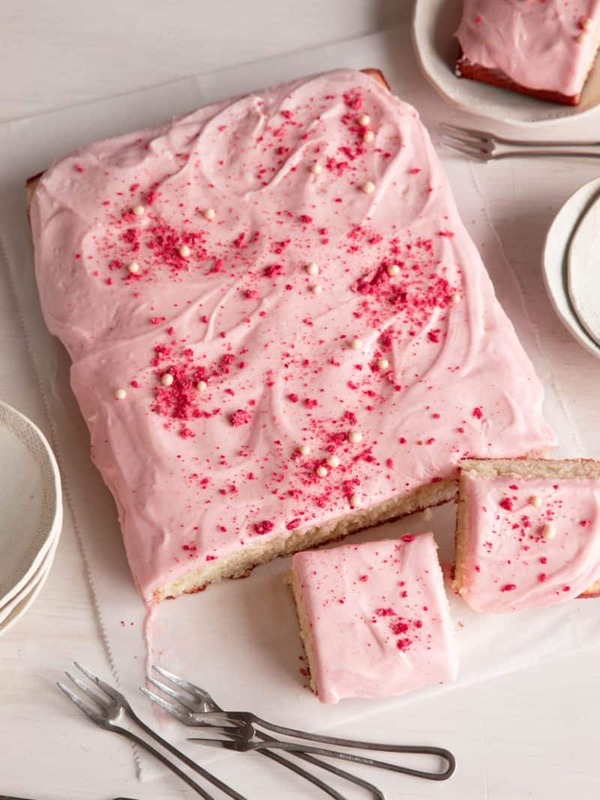 To assemble: Scoop frosting onto top of cake and spread evenly over the top with a spatula. Sprinkle with crushed freeze-dried strawberries and white chocolate crispy balls, if using. Slice and serve. looks fantastic! but how do I make white chocalate crispy balls? lol, I got them at my local whole foods, but amazon has them too! Great idea for a little girl’s birthday! I have one coming up that I’ve been looking for a recipe for. YUM! I’ve been on a baking kick at the moment so I think this one has to make it into the roster at some point!